Normally, I consider myself a relatively open-minded and somewhat trendy person. I won’t lie; I like to participate and bond with people over hip stuff. But there are just some trends I can’t get behind, no matter how cool they are, even if my popularity decreases exponentially for disliking said things. Liiiike Taylor Swift. Okay, so I grow up in an anti-country-music household. It’d be totally taboo to listen to T-Swift, and when I first saw her, I thought OMG, she’s so cute, we could be like, BFFs in real life probably. But after reading about her in tabloids and interviews and hearing her music more times a day than I blink, I began to realize there’s no way in friggin’ hell TayTay and I would ever be friends. She’s a psycho. And her catchy songs are like my demise. Anytime I hear one, it infiltrates my brain like some poppy parasite and I justcan’ttakeitanymore. Or flipflops. Duuude. I just cannot get behind these atrocious shoes no matter how hard I try. I own ZERO pair of flipflops and pledge to continue to own zero pair. They’re just so.. gross. It’s really no surprise why I love winter so much, even if flipflops are replaced by their ugly, hairy cousin, the Ugg boot. Still cuter than bare feet. Or strawberry jelly. Call me cray-cray, but I hate the stuff. It’s seedy and weird tasting and OH MY GOD IT’S AWFUL. I mean, thank the good lord above that most places offer grape or strawberry, because if strawberry were the only option, I’d honestly rather starve. My tastebuds cannot handle the despair that is strawberry jelly. Okay. So now that I proved I’m totally and utterly insane, how about I redirect your attention to these Peppermint Nanaimo Bars? For the longest time I had noooo idea how to pronounce “nanaimo” (okay, still don’t really know) but just because I couldn’t say it didn’t mean I couldn’t make it. So I made them and then, I knew. Some may wag their finger that these aren’t “true” nanaimo bars. Nanaimo bars are typically no-bake with a custard-like filling in the center. 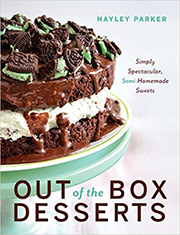 My version, however, features a fudgy baked base and a smooth + creamy peppermint filling, similar to a thick frosting. Tomato, tomahto. They’re still amazeballs. Traditionally, Nanaimo bars aren't baked, but I couldn't resist a fudgy brownie base for these delicious bars. Preheat oven to 350 degrees F. Line a 13x9" pan with foil, extending sides of the foil over the edge of the pan. Spray the foil lightly with cooking spray. In a large bowl, combine the cake mix, egg and melted butter with a spoon. Press the mixture evenly into the prepared pan and bake for approx. 15-18 minutes or until a toothpick inserted in the center comes out clean. Cool completely. In the bowl of a stand mixer, beat together the softened butter, peppermint stick flavor packet, milk + powdered sugar until combined. Spread the filling mixture evenly over the cooled bars. Allow the filling to set, about 30 minutes-1 hour in the fridge. Melt the chocolate chips and Tablespoon of oil in the microwave until smooth. Spread the chocolate mixture evenly over the filling; sprinkle immediately with crushed candy canes. Allow the bars to set in the fridge for another hour or so before cutting into squares. These bars can be served up to 2 days later when stored in the fridge. Chocolate and peppermint, to be specific, is one of my favorite flavor combinations. While I’m typically more of a white chocolate fiend, I love the rich, fudgy flavor of the milk chocolate base and creamy chocolate topping in contrast with the cool and dreamy peppermint filling. The added crunch from the crushed candy canes add a nice touch and bring out the peppermint filling flavor a bit more.. and more is always better when it comes to peppermint! I looove chocolate and peppermint, too, so I know i’ll love these! I really need to get my hands on some red and white candy canes! Never tried Nanaimo bars before. But I’ll crawl out from my rock and be sure to try these! I LOVE peppermint! These look delicious Hayley! Oh these sound heavenly. They look so good! I love the chocolate and peppermint combo, of course. Thanks for sharing! And I love these bars. Can’t wait to try them. This is one of my absolute favorite Christmas desserts. I look forward to baking these every year. Why I make myself wait 11 months to make this recipe beyond me. It’s basically torture. But it’s absolutely worth it when December rolls around and I can eat my weight in these bars. Yours look delicious Hayley! I love my ugly Uggs. I have 5 pairs. Yes, 5 pairs. and TWO pairs of Ugg slippers. I am not only addicted to baking, but to Uggs as well. Love all the peppermint here Hayley!! I’ve never made Nanaimo bars but after seeing Averie’s and now yours, I am tempted to try them at some point!!! Oh my, yes please! These look amazing! I am on a peppermint kick and these would totally hit the spot right about now. I love reading about you cray cray likes/dislikes. So funny! Ok I can see you on jelly and Taylor Swift. But I love me some flip flops! And I want these bars! Okay, first, I’m LOVING the photos here! The way the peppermint filling is oozing out, the clarity of the peppermint chunks in the second pic…I want to reach through my screen and grab these! I love, love, LOVE peppermint, and these bars? Amazing! Ha, you seriously crack me up! 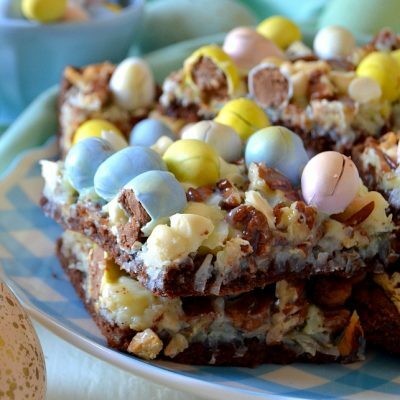 And make me hungry – OMG these bars look ah-mazzing! I’m behind on the trends…I didn’t know about these until now! (But am so glad I do!) I am so into all things peppermint, and these are perfect! I’m with you on the flipflops…they wear them to church here…drives me nuts. Mmm Hayley these look yummy! I love anything peppermint & chocolate! It’s funny…all the things you hate, I love – kinda random! 3. I have never heard of a Nanimo bar, but OMG these look to Die for Good! 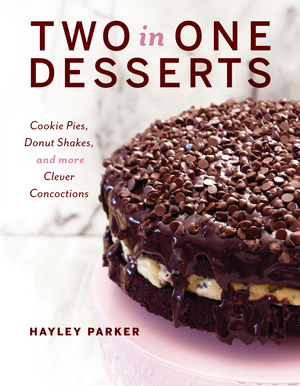 Hayley I’m a big fan of Nanaimo bars and made some last month after wanting to try them for years – fun twist with yours and the peppermint! I <3 you!! These look amazing…or amazeballs. P.s. I'm with you on the pronounciation, but flip flops…really?! Love them, lol. Have an awesome weekend, lady! I want to make these tomorrow, but don’t have the frosting packet. Any suggestions? Hi Andrea, you can substitute peppermint extract for the frosting packet. Start at 1/2 tsp of extract, then add a little more at a time to suit your tastes if you want it stronger (stuff is potent!) For the pink color, add a small drop of red food coloring to combine. Let me know how you like them!